If ham has rind, remove it with a sharp knife. Sprinkle the ¼ tsp of ground cloves on outside. Combine ½ cup brown sugar and honey, cider, lemon juice and rind, and spices. Pour over ham in roasting pan. Cover with foil or lid, and bake in 350 F oven for 1 to 1 ½ hour or the internal temperature reaches 160 F. Baste occasionally, adding the raisins and dried fruit for the last half hour. Mix remaining ¼ cup brown sugar and honey; spread on top of the ham. Raise heat to 425 F and bake uncovered about 15 minutes longer. 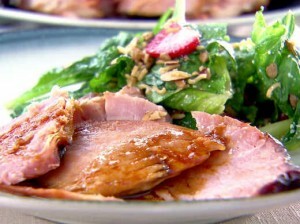 Remove ham to a platter Skim any excess fat from roasting pan. Blend cornstarch with cold water; stir into roasting pan on top of stove. Cook and stir until thickened. Serve the sauce separately, or spoon a little over each serving. Can use Lemon juice and dried lemon rind instead of fresh lemon. Can use 1 cup of apple juice and ½ cup of apple cider vinegar instead of the apple cider.